Chemists at the University of California, Santa Cruz, have developed novel compounds that show promise for photodynamic cancer therapy, which uses light-activated drugs to kill tumor cells. The new compounds, called dye-sensitized ruthenium nitrosyls, are absorbed by cancer cells and respond to specific wavelengths of light by releasing nitric oxide, which triggers cell death. "For cancer treatment, you want localized delivery of a very high concentration of nitric oxide. We've designed these molecules to do just that," said Pradip Mascharak, professor of chemistry and biochemistry at UCSC. Nitric oxide is a simple molecule with a wide range of biological effects. Long known for its role in regulating blood pressure, it has attracted the attention of cancer researchers in recent years. According to Mascharak, one advantage of nitric oxide for cancer treatment is that it induces an orderly type of cell death known as apoptosis. Also known as "programmed cell death," apoptosis does not lead to the inflammation, pain, and swelling normally associated with damage to cells and tissues in the body. The drugs currently used in photodynamic therapy, called photosensitizers, produce a highly reactive form of oxygen when activated by light. The reactive oxygen kills cells in a way that tends to cause local swelling and inflammation. Mascharak and graduate student Michael Rose have synthesized several different ruthenium nitrosyls in their lab. They described these compounds in detail in a recent paper published in Inorganic Chemistry (published online May 29, 2009). In another paper published last year in the Journal of the American Chemical Society, the researchers reported that the compounds were effective against breast cancer cells in laboratory experiments. "We know it works in cancer cells, so now we're very confident about taking it to the next level," Mascharak said. "The idea for cancer therapy would be to embed the compounds in a matrix that you can place in the treatment site, then shine light on it to produce a high concentration of nitric oxide." In designing the ruthenium nitrosyls, Rose and Mascharak were inspired by natural bacterial enzymes called nitrile hydratases, which release nitric oxide as a by-product when activated by light. "We borrowed the idea from nature," Mascharak said. "Our initial goal was to understand these very unusual enzymes. Every hint that nature embedded in the behavior and structure of the enzyme we employed in designing a drug that can deliver nitric oxide in a very site-specific and controlled way." Rose, who earned his Ph.D. this year, has been working on the project since 2004. He began by replacing the iron atom in a synthetic model of the enzyme with a different metal, ruthenium. "Iron complexes are good in nature because they are highly reactive, but if you're trying to make a drug you want something that's more stable," Rose said. "The ruthenium complexes are much more stable when dissolved in water." The first ruthenium nitrosyls he made released nitric oxide only under ultraviolet light, so Rose spent several years developing ways to sensitize them to specific wavelengths of visible light that could be used in photodynamic therapy. He did this by attaching dye molecules, called chromophores, to the ruthenium complex. To test the resulting compounds as potential drugs, the chemists teamed up with breast cancer researcher Lindsay Hinck, a professor of molecular, cell, and developmental biology at UCSC. Hinck and postdoctoral researcher Rebecca Marlow worked with Rose to test the dye-sensitized ruthenium nitrosyls against breast cancer cells growing in tissue culture. The unactivated compounds are fluorescent, which allowed the researchers to track them using a fluorescence microscope as the compounds were absorbed by the cancer cells. 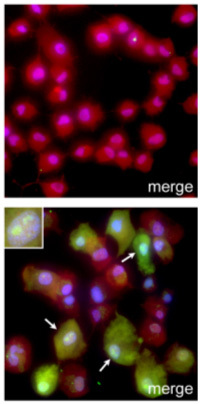 The release of nitric oxide after exposure to light quenched the fluorescence, and the cells showed signs of apoptosis within four to eight hours. "That was probably the most exciting day of my grad school career, when I looked through the microscope and saw the fluorescent compounds in the cells," Rose said. Rose used a commercially available dye initially, then synthesized new dyes so that he could customize their properties. "In the end, the whole molecule was built from scratch in our lab," he said. "That's the fun of synthetic chemistry: It's like building with Legos, but you get to make your own Legos, so it's even better." Mascharak said he now plans to collaborate with medical researchers at UCLA to conduct additional tests of the compounds in a tumor model. Meanwhile, he and Rose have continued to investigate the unusual chemistry of nitrile hydratases. They have just published their findings in the Journal of the American Chemical Society (published online May 27, 2009). "We have now clearly shown the mechanism for how the enzyme nitrile hydratase is photoregulated by nitric oxide. This process gave us the idea of making light-sensitive metal nitrosyls as antitumor drugs," Mascharak said.